Lincoln Center hosted two milestones this week: on Wednesday, The Juilliard School produced a gripping production of Handel’s Radamisto incorporating into an opera for the first time its much-heralded original-instrument orchestra Juilliard 415, while the following night saw choreographer Mark Morris’s radiant setting of Handel’s L’Allegro, il Penseroso ed il Moderato returning to celebrate its 25th anniversary as part of the White Light Festival. Given the relative scarcity of Handel’s operas in New York City, it is remarkable that Radamisto was preceded earlier this year by a concert version by The English Concert at Carnegie Hall. However, Juilliard’s was fully staged in a strikingly simple but powerful production directed by James Darrah and designed by Emily Anne MacDonald, Cameron Jaye Mock and Sara Jean Tosetti. The stage of the Peter Jay Sharp Theater was bare except for a 12-foot wall in front of which the singers performed using only a few chairs to differentiate scenes and locales. This effectively focused attention on the trials of Radamisto and Zenobia as they struggled to escape the political and sexual advances of the rapacious Tiridate. As is usually deemed necessary, this great work was substantially abridged, but those cuts were done with care, although I missed Radamisto’s remarkable third-act aria, “Dolce bene di quest’alma.” Nearly all the da capo repeats were honored—only the reduction of Tigrane’s “Vuol ch’io serva” to just its A section proved jarring. However, it was disappointing that during the enthusiastic final applause Wachner failed to acknowledge his heroic continuo team of cellist Michael Unterman, harpsichordist Patrick Jones and theorbist Kevin Payne. And I wondered why Zenobia’s wrenching cavatina “Quando mai, spietata sorte” was accompanied by two traverse flutes rather than by an aching oboe as done in all other performances and recordings I’ve heard. Since ornamentation is integral to the style, each singer needs to learn to ornament in a way that fits the musical style, highlights the dramatic moment, and flatters their voice. Our coaches and, ultimately, the conductor will help guide them toward these solutions. Here Wachner and his colleagues let down their cast: many arias found the singer performing strenuous cadenzas (particularly ending the B section) what inevitably took them well beyond their comfort zones. All too often this resulted in strained high notes that flattered neither the singer nor the music. Despite the misguided ornamentation, the cast performed admirably with countertenor John Holiday in the title role displaying a sweet, high voice that coped admirably with slower arias like “Cara sposa” and “Ombra cara.” If he was somewhat less successful in the showier bravura pieces, he still made an excellent impression despite a sometimes disconcertingly passive stage manner. As his much put-upon wife Zenobia, French mezzo Virginie Verrez gave a thrilling, no-holds-barred portrayal that occasionally brushed aside the niceties of baroque style and veered toward something more veristic. As Polisenna’s shockingly brutish husband Tiridate, commanding bass-baritone Aubrey Allicock (who was such a marvelous Forester in Juilliard’s production last season of Janácek’s Príhody lisky Bystrousky) again demonstrated why he has been mentioned as one of his generation’s more promising young singers although one doubts that Handel will remain a part of his core repertoire. As Fraarte (a role completely omitted from The English Concert’s performance) and Tigrane, sopranos Pureum Jo and Elizabeth Sutphen seemed often over their heads in florid music that challenged their still-developing techniques. Bass Elliott Carlton Hines worked hard as Radamisto’s father Farasmane for little reward as his single aria was omitted. Thanks to Wachner and Darrah’s intensity and passion, this Radamisto (being performed until Sunday) proved to a rapt and appreciative audience that heroic opera seria can be consistently enthralling, not the intimidating art form it can appear to be. Morris’s masterwork might also be seen as a challenge to modern audiences: L’Allegro is a two-hour pastoral ode written by Handel in 1740 in a little over two weeks to texts drawn from two works by John Milton, author of Paradise Lost. Unlike the operas or oratorios, there are no characters, no secco recitatives and no plot; instead the text debates the desirability of a life devoted to either “mirth” or “melancholy.” However, Handel and his collaborators apparently decided that neither represented the ideal, so a third section Il Moderato was added that proposed that one should embrace instead a life of moderation. Morris has long been interested in baroque music, particularly vocal music, and his early works include Gloria (Vivaldi’s setting of that sacred text), Jealousy (using a chorus from Handel’s Hercules) and One Charming Night (from The Fairy Queen, as well as other works by Purcell). 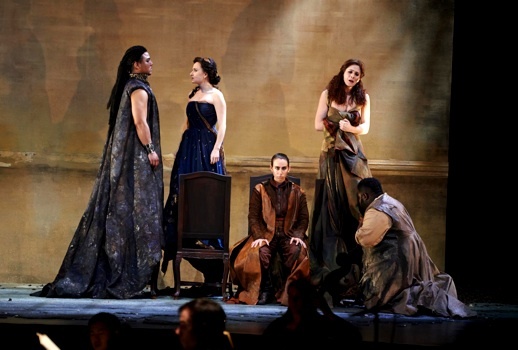 He has also staged Purcell’s King Arthur and Rameau’s Platée, both of which were seen at the late New York City Opera. So it was no surprise that Morris chose Handel’s bucolic L’Allegro to inaugurate the tenure of the Mark Morris Dance Group as ensemble-in-residence at Brussels’s Théâtre Royal de la Monnaie. With the resources offered there by Gerard Mortier, he was able to mount his most ambitious work ever, an evening-length piece for 24 dancers, with an orchestra, chorus and four vocal soloists in the pit; it premiered on November 23, 1988 and remains perhaps his most acclaimed work. The MMDG has mounted L’Allegro every year since 1994 and these three performances at White Light are the work’s seventh New York engagement since its 1990 US premiere at the Brooklyn Academy of Music. I vividly remember attending that initial run; I was not yet living in New York, and although I had read about Morris’s work and seen his marvelous Dance in America episode on PBS (which featured sections of Gloria), I knew I had to make a special trip to see my first live Morris. Perhaps because I already knew Handel’s music well, L’Allegro immediately worked its joyous magic on me as well as the hundreds at BAM who shouted their approval at the final curtain. I caught it again at Lincoln Center in 1995 and 2002 finding it as intoxicatingly vernal as it did on Thursday at the Koch Theater. Aided by the extraordinarily subtle, beautiful sets of Adrianne Lobel, costumes by Christine Van Loon and lighting by James Ingalls, Morris creates an idyllic communal world where no individual holds precedence for more than a moment. L’Allegro features performers who rarely dance alone, more likely each is accompanied by at least one other dancer, while quite often the entire ensemble fills the stage. Often the movements and combinations are extremely intricate but occasionally dancers simply traipse across the stage hand-in-hand. Morris tampers with Handel a bit—moving some numbers around and omitting much of Il Moderato, so the work ends not with a chorus praising “moderation” but instead with the triumphant chorus “These delights if thou canst give,/Mirth, with thee we mean to live.” However, one of the most enthralling numbers is set to Il Moderato’s sublime soprano-tenor duet “As steals the morn” where the dancers divide into four lines of six criss-crossing the stage in increasingly intricate forms. These patterns mystically mirror Handel’s music in such a powerfully moving way that once again I found myself in tears. Although occasionally it becomes mimetic (a witty hunting episode shows the prey escaping the pursuing dogs), most of the choreography becomes instead a rapturous transformation of the words and music into movement so right, so ravishing that it indelibly imprints on one’s consciousness. It’s nearly impossible now to hear the score (which I have been helplessly listening to for days) without “seeing” Morris’s work. The same thing occurs when I listen to Tchaikovsky’s Serenade for Strings and involuntarily “see” George Balanchine’s choreography throughout. As always the members of the MMDG moved with witty vivacity and a disarming lack of ego: the goal is always the primacy of the group rather than the individual. Rarely does one experience an ensemble that so effortlessly embodies the joy of performing. Sadly, musical matters were less satisfying; conducting the MMDG Music Ensemble and the Riverside Choral Society Chamber Singers, L’Allegro veteran Nicholas McGegan drew a measured and disciplined performance. I was disappointed though that an original-instrument group wasn’t used, as it was when McGegan conducted his own Philharmonia Baroque when I last saw L’Allegro–during the 2002 Mostly Mozart Festival. The use of a modern flute for “Sweet bird” was less happy, and the substitution of a celesta (which wasn’t even invented until the 1880s) for Handel’s carillon for the beginning of the miraculous “O let the merry bells ring round” chorus which ends the first half was bizarre and unsatisfying. However, the greater problem was the soloists. Soprano Yulia Van Doren was the best of the quartet, singing cleanly and with sweetness, and, while he occasionally struggled with the coloratura, bass Douglas Williams was otherwise satisfying. On the other hand, soprano Dominique Labelle and tenor John McVeigh bordered on the disastrous. Labelle, long a favorite of McGegan’s and whom I have previously admired as a lovely advocate of Handel’s music, seemed to be in serious vocal distress where every high note emerged as a loud scream even in the midst of a quiet vocal line. Perhaps the orchestra’s (presumed) tuning at 440 rather than at lower baroque pitch disconcerted her. McVeigh was even more troubling, his tenor now ugly and throaty and only able to negotiate high notes by resorting to grotesque yelps. For those yearning for a more satisfying traversal of Handel’s bewitching score, a very fine recording conducted by Peter Neumann has recently been released on Carus, while John Eliot Gardiner’s classic version happily remains available. Morris returns to Handel for the first time since L’Allegro this spring when he sets Acis and Galatea (albeit in the Mozart realization) for Berkeley and Boston. One can only hope that he will once again reveal the magic in Handel that he mined so superbly in his now 25-year-old masterpiece.